The campaign for the September 26 National Assembly elections will be a crucial battle between the supporters of socialist President Hugo Chavez and the U.S.-backed right-wing opposition. But these battles, part of the class struggle between the poor majority and the capitalist elite, will be fought more in the streets than at the ballot box. So far this year, there has been an escalation of fascist demonstrations by violent opposition student groups; the continued selective assassination of union and peasant leaders by right-wing paramilitaries; and an intensified private media campaign presenting a picture of a debilitated government in crisis – and on its way out. Chavez warned on January 29: “If they initiate an extremely violent offensive, that obliges us to take firm action – something I do not recommend they do – our response will wipe them out.” The comment came the day after two students were killed and 21 police suffered bullet wounds in confrontations that rocked the city of Merida. Chavez challenged the opposition to follow the constitutional road and a recall referendum on his presidential mandate if they truly believe people no longer support him. Under the democratic constitution adopted in 1999, a recall referendum can be called on any elected official if 20% of the electorate sign a petition calling for one. He said if the capitalists continued down the road of confrontation, he would “accelerate the revolution,” which has declared “21st century socialism” as its goal. The stepped-up campaign of destabilisation is part of the regional offensive launched by the opposition’s masters in Washington. Last year, the U.S. installed new military bases in Colombia and Panama, reactivated the U.S. Navy Fourth Fleet to patrol Latin American waters, and helped organize a military coup that toppled the left-wing Manuel Zelaya government in Honduras. This year, the U.S. has occupied Haiti with 15,000 soldiers after the January 12 earthquake and U.S. warplanes have been caught violating Venezuela’s airspace. A February 2 report from U.S. National Director of Intelligence, Admiral Dennis Blair, labelled Venezuela the “leading anti-U.S. regional force” – placing the Chavez government in Washington’s crosshairs. A U.S. military invasion cannot be ruled out, but the main aim of the U.S. military build-up and provocations is to apply pressure on those sections of Venezuela’s Armed Forces, and others in the pro-Chavez camp, that would prefer to put the brakes on the revolutionary process to avoid a confrontation. This is occurring hand-in-hand with a campaign of media lies, combining claims that Chavez’s popularity is rapidly declining with rumours of dissent in the military and government. The U.S. and Venezuelan elite hope to isolate and ultimately, remove Chavez. The opposition hopes to fracture Chavez’s support base – the poor majority and the armed forces – and win a majority in the National Assembly (with which it is likely to move to impeach Chavez). At the very least, the opposition is seeking to stop pro-revolution forces from winning a two-thirds majority in the assembly, which would restrict the ease with which the Chavistas could pass legislation. The current assembly has a large pro-Chavez majority as a result of the opposition boycotting the 2005 poll. The global economic crisis is hitting Venezuela harder than the government initially hoped. Problems in the electricity sector, among others, are also causing strain. The government’s campaign to raise awareness about the effects of climate change and wasteful usage has minimised the impact of the opposition and private media campaign to blame the government for the problems in the electricity and water sectors. Far from fulfilling right-wing predictions that falling oil prices would result in a fall of the government’s fortunes, Chavez has continued his push to redistribute wealth to the poor – and increased moves against capital and corruption. This is occurring alongside important street mobilisations supporting the government (ignored by the international media, which gave prominent coverage to small opposition student riots). In November, Chavez announced interventions into eight banks found to be involved in corrupt dealings. A majority were nationalised and merged with a state bank to form the Bicentenary Bank. Together with the Bank of Venezuela, nationalised in 2007, the state now controls 25% of the banking sector – the largest single bloc. Nearly 30 bankers were charged and face trial over the corruption allegations. Significantly, a number of these had been closely aligned with the government. One of them, Ricardo Fernandez Barrueco, was a relatively unknown entrepreneur in the food sector who rose up the ranks of the business elite to own four banks and 29 Venezuelan companies. State institutions, militants of the Chavez-led United Socialist Party of Venezuela (PSUV), and the National Guard have also moved to tackle price speculation following the January 8 decision to devalue the local currency, the bolivar. More than 1000 shops were temporarily shutdown for price speculation in the first week after the announcement. On February 13, Chavez announced that the government had come to an agreement with French company Casino to buy out 80% of its shares in the CADA supermarket chain, which has 35 outlets across the country. Together with the recently nationalised Exito supermarket chain and the mass importation of various essential goods, the government is moving to take up a much larger share of the retail and distribution sector. The bolivar devaluation means imported goods have become more expensive, lowering workers’ purchasing power. To compensate, the government decreed in January a 25% increase in the minimum wage (10% to be implemented in March and 15% in September). Government sources told Green Left Weekly it is also studying a further wage increase and steps toward establishing a state monopoly over foreign trade. Despite the violent protests and slander campaign, a January poll by the Venezuelan Institute of Data Analysis (IVAD – generally accepted as one of Venezuela’s least biased polling companies) found more than 58% of Venezuelans continue to approve of Chavez’s presidency. The same poll also found 41.5% believed the opposition should have a National Assembly majority, compared to 49.5% who didn’t. That 33.1% will undoubtedly shrink by September. The question is whether this section will abstain (as in the 2007 constitutional referendum) or the revolutionary forces can organize themselves to win them over and deal a decisive blow to the right. A new grouping of revolutionary youth organzations, the Bicentenary National Youth Front, has also been created to organize the pro-revolution majority of youth and students. The injection of organized youth into the revolution is vital for its future. This is needed, as Chavez noted in his February 12 speech to a mass demonstration of students in Caracas, to tackle the serious problems of reformism and bureaucratism that hamper the revolution. Chavez has argued against those sectors of the revolutionary camp that insist it is possible to advance by strengthening the private sector and wooing capitalists. 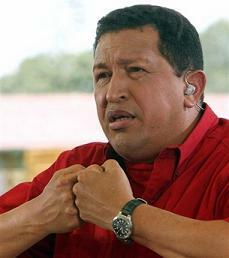 Chavez has repeatedly said the “national bourgeoisie” has no interest in advancing the process of change. Chavez has emphasised the “class struggle” is at the heart of this process. He said it was vital to combat the inefficiency and bureaucracy of the state structures inherited from previous governments that hold back and sabotage the process. “We have to finish off demolishing the old structures of the bourgeois state and create the new structures of the proletarian state.” To help achieve this, the government has encouraged the creation of 184 communes across Venezuela. Communes are made up of a number of communal councils and other social organizations, bodies directly run and controlled by local communities. Chavez has referred to the communes as the “building blocks” of the new state, in which power is intended to be progressively transferred to the organized people. The recent creation of peasant militias, organized for self-defence by poor farmers against large landowner violence, is also important. However, the biggest challenge is the continued construction of the PSUV, a mass party with millions of still largely passive members, as a revolutionary instrument of the masses. In its extraordinary congress, which began in November and continues meeting on weekends until April, debates are occurring among the 772 elected delegates. Differences have arisen between those who support a more moderate reformist approach and those arguing for a revolutionary path. The debates also included whether party members will elect National Assembly candidates, or whether this important decision would be left in the hands of a select committee (as more conservative forces preferred). Federico Fuentes is a member of the Green Left Weekly Caracas bureau. This article first published at Green Left Weekly website.